Are we living in a virtual or real world? Soon nobody can make the difference! Make a Prezi presentation on the topic of virtual reality or augmented reality. 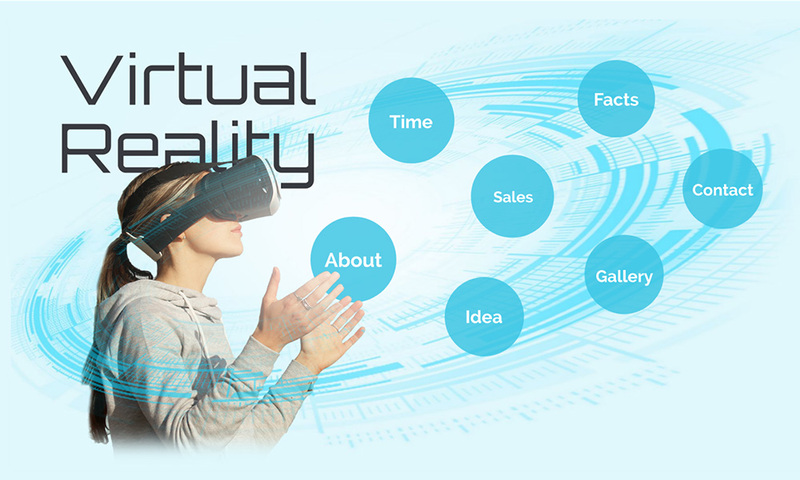 Presentation template with a woman wearing VR headset and a blue technology circle illustration hovering in the air. Zoom into the topic circles and insert your own presentation content. Talk about the history of VR technology, how is it going to be used, VR games in education or in the entertainment sector. The presentation starts with an overview slide featuring a woman wearing a VR headset being overwhelmed by the technology and blue technology circle interface hovering in the air. 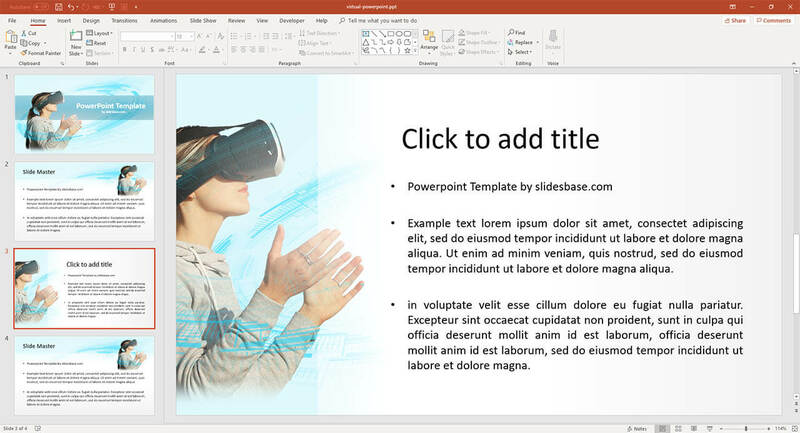 The overview also features a large text placeholder for your presentation title, which is placed slightly behind the head of the woman, giving the template a nice 3D space effect. Zoom into the blue circles and presenta your content about virtual reality technologies and the future in this sector. 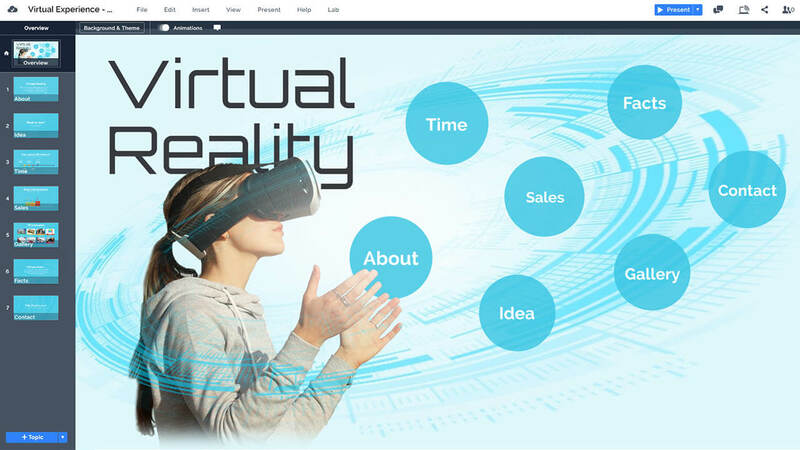 Back to reality now: a PowerPoint version of the Virtual Reality template is also included in the purchase. The PPT version includes 2 alternative slide layouts for you to choose from and represents a more static version for making a VR presentation. This entry was posted in Best Prezi presentation templates, Prezi Next Templates and tagged augmented reality, blue technology, display, Future Technology, hologram, hover, oculus, oculus rift, prezi next virtual reality, technology, technology circle, template presentation virtual reality, virtual business, virtual experience, virtual museum template template, virtual reality, virtual reality powerpoint template, virtual reality powerpoint templates free, virtual reality presentation template, virtual reality template, virtual reality template presentation, virtual technology, virtual template, virtual tourism, vr, vr business, VR gear presentation, vr headset, vr headset presentation, VR ppt template, VR presentation template, vr prezi template, vr technology.